I have a thing for sportsy, outdoorsy films – it is a pretty interesting way to get a little bit of the outdoors mixed in with a the story of interesting athletes. One of the neatest bars I have been to – Mai Tai Bar in Honolulu – gets major points – not for aestiques – it is actually on the roof of a mall in Honolulu – but bonus points for their entertainment – they have live isalnd music in the bar and show skiing and surfing films on the TVs. (There is also a Mai Tai Bar in Daytona Beach – that I visited earlier this year with the hopes of shipping a drink and watching surf films – instead the evenings entertainment was the cover band Spandex Super Heros). But back to Banff – the Banff film festival is THE outdoor film festival and each year they put together a collection of the best outdoor films. 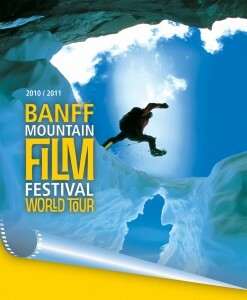 Venture Outdoors brings the festival to town and this year – Banff is bigger than ever with three days of films. Each day will have a different line up of films- check out the complete line up here.